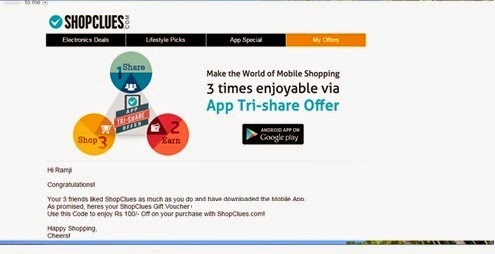 Hello friend this time we are come up with Shopclues refer and earn offer in which you can earn free Rs 100 Shopclues Gift Voucher by referring your 3 friends to download shopclues app.Those who are not familiar with gift voucher let me describe in brief,Gift voucher works like credits in paytm,freecharge,etc.This is super awesome offer in which all you have to do is to get your referral link and share it with your friends,for 3 successful referral you will get Rs 100 shopclues gift voucher. 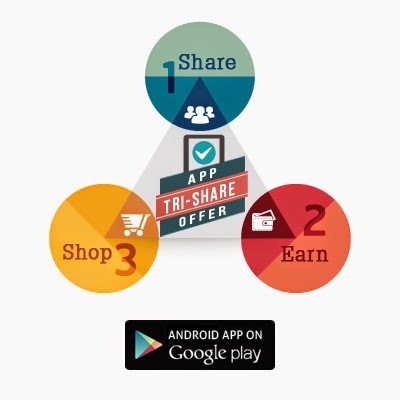 Simply we can say that refer 3 friends to download Shopclues app with your referral link and get Rs 100 shopclues gift voucher which will make you to shop for Rs 100 for free. Connect with facebook,google or enter email and name. After that you will confirmation email from shopclues which will contain your referral link. Share your referral link with your friends. 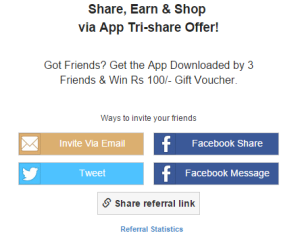 If three of your friends download the shopclues,you will get free Rs 100 shopclues gift voucher. Thanks for reading this post. Please share it with your friends and support us.